High-precision deflection of light beams in an ultra-high vacuum (UHV) in the Petra III research centre at DESY. Our VSS motors adjust two prisms, using which a light beam can be shifted in parallel. 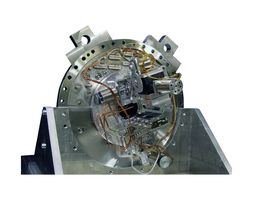 The plant works with an ultra-high vacuum (UHV). Because molecular impurities emitted by the motor can settle on the prisms or could disturb the light beam directly, the researchers at DESY rely on our conditioned VSS UHV motors. The first pair of crystals can be adjusted vertically to the beam (by a Phytron UHV VSS motor) and is water cooled indirectly. The second pair of crystals is fixed on a 2-axis mechanism. To be able to align this mechanism in relation to the first crystal, it can be pushed along the beam (by two Phytron UHV VSS motors). A piezo micro goniometer takes over the fine tuning.